Funny, isn’t it, how different it was pre-internet? As ever, a number of things all dovetailed to result in a project I swore I would NEVER try again. Yep. Art Journals. My track record is appalling, at least as appalling as any attempt at Project Life. I WANT to do both. I ENJOY doing both when I do have a go, but I just can’t seem to muster up the commitment. I see others setting off on this creative journey and I am envious they can follow thru and I can’t seem to. But having a chat in a UKS thread about AJs, asking others for some input on their trigger moment and what keeps them doing it, it occurred to me that one of the best reasons to do it is you get to make art and KEEP it. When I make something I really love it can be hard to set it free – even stuff like the things I made at Christmas for DH and DS were in a way hard to part with. I thought I might begin by seeing if I could create a journal-like thing with the idea that it would be more a place to house arty-farty play, and if at any point I felt driven to journal in it, well that would be a bonus. But like the 52 BIG CARDS, otherwise it could just be a place to create that I didn’t have to give away, that would store in a relatively small space (unlike say canvases, for example!) and where I could just play. So then I thought what to make? I didn’t want to begin with Gelli prints, for example, as they are busy (or at least mine usually are) and I wanted free rein to try any old thing that appealed to me. I didn’t want to begin with a ready-made book either, as I just love the whole bookmaking process. And I wanted something that was a little different. 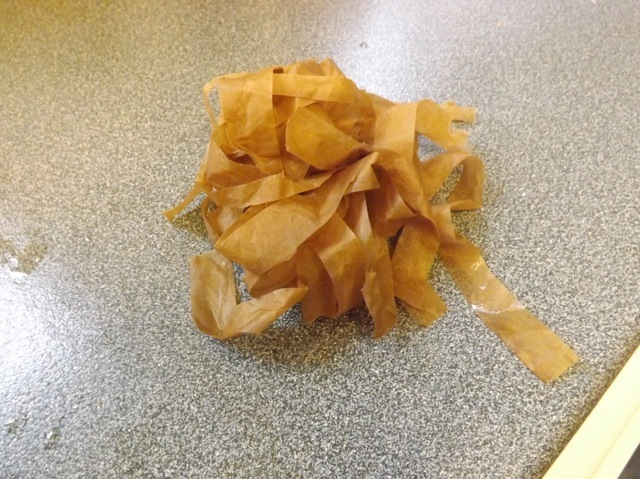 I thought back – while having my massive tidy-up pre-Christmas, I can across a stash of paper lunch bags. I think I am over paper-bag books. I’ve made maybe 10 projects, all variations on the norm, trying out all manner of odd constructions, and have seen a handful of really unique ones by others. I don’t need any more mini-books, as much as I like making them, so maybe I could use them as the base. I have the habit of browsing You Tube for videos when I have an idea – I always want to know if it’s been done before – so had a quick look for paper bag art journals. I did find a few, none that looked quite like what I saw in mind, but not a million miles away. One video (which I won’t identify) was informative up till the point the filmer knocked the camera off the desk. There was a part 2 but I felt I had actually gotten the point and didn’t need to watch more. What stuck with me is she mentioned wetting, scrunching bags, and ironing them, and that reminded me of a faux leather technique that I’ve done before and sounded like just the textural idea I wanted for the bag-base. I didn’t have much luck finding any sort of video on that so shifted to image display and I found THIS. What also interested me was the date! 2007. but totally new to me. 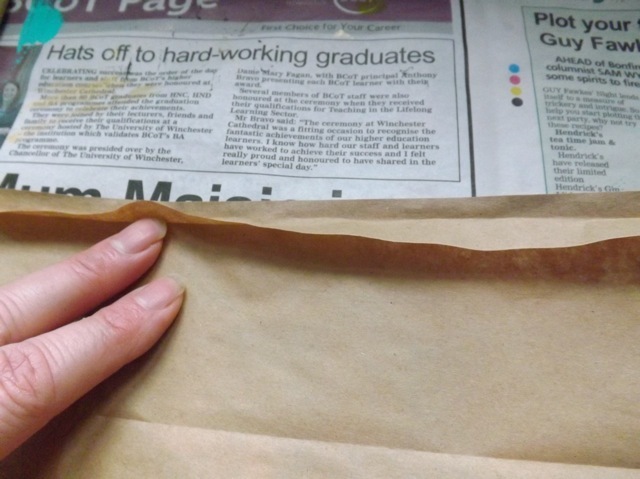 Just what I had in mind, although I was thinking lunch bags, because I had them, and except for Primark I’m hard pressed to think of a place locally that gives out HUGE brown paper bags anymore – or the next time I am likely to buy enough stuff to warrant a huge bag, to be honest. Not a ton of info but all you need with a few photos. Perfection. SO I took what I learned, matched it with what I had on hand, and started. Then, following Judy’s soaking and scrunching technique, I found wetting the bags made removing the glued strips a piece of cake. Rather than laboriously trimming them all, I just peeled them all away after their soak. I hung them all up in the warm kitchen, where I had a massive pot of chicken soup on the go, and let them dry. Then a quick iron and they came up so lovely and textured. 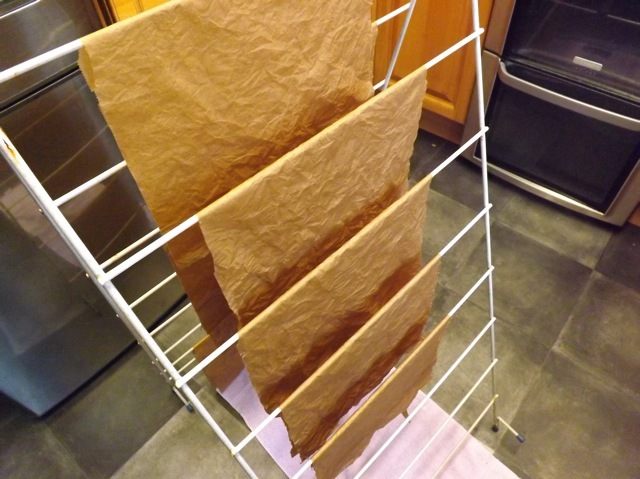 I did find the trick was to barely skim the surface of the bags, so the heat made them contract, I guess, rather than ironing them like you would a shirt. Enhance the wrinkles rather than press them away. Now, the big arty pieces I showed for WOYWW actually will be too small for this. My plan had been to fold them (actually I showed only one, now I think about it, but actually made two) and slip signatures inside. 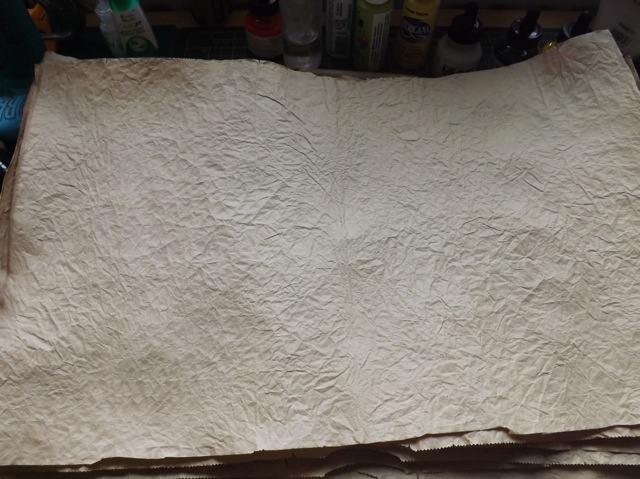 Well the base watercolour paper was NOT 20 inches, more like 15, so now I just have to consider how to put it all together – and if where I am now (two signatures of 5 folded sheets or about 20 pages) is the right number. I think it is, as much bigger and it will be far too daunting and any smaller and it’ll be full too fast! I’ve been fiddling about with two front and back cover pieces and am considering something I did mention ages back, when I was making the torn paper “fabric” book, and simply machine stitch the signatures to a spine piece then attach the covers to that, but I’m just not ready to take the plunge till I maybe make a mock-up to see if it opens flat enough to work in. Then we’ll see…will I bail? fail? forget? or will I actually manage to make a few things in it, with or without words? What do you think? Categories: art journal, handmade books, tutorial | Tags: art journal, handmade books, how-to | Permalink. I’ve also used paper bags to make both backgrounds and books. I couldn’t find a tutorial for the paper bag backgrounds, but I posted it here: http://alteredbooklover.blogspot.com/2012/06/bleubeard-and-elizabeths-color-and.html (about half way through the altered book homework lesson) and my paper bag book I made using a piano hinge instead of stitching: http://alteredbooklover.blogspot.com/2013/06/buried-treasure-piano-hinge-paper-bag.html This one uses paper bags that are intact. I really like how you didn’t iron all the texture out of yours. I really like that yours are larger, too. Of course, I’m NOT a journaler, so I hope you find the patience to work on your book. I look forward to seeing this project progress. Late for WOYWW so thought to comment here..wow. Love the background you’ve got on your desk yesterday, and a bit phased by the idea of the paper bag book journal thing. Not least because like you, I don’t do the whole Art Journal thing, and then because hey..how much work!!! No doubt you’ll overcome my resistance! Hi, love this, and plan to make one. As far as journaling goes, I am so bad with words so I just do art, sketch, experiment. If any words come, I use them but I am not a wordy journaler. On any Wednesday click the WOYWWlink – Julia can explain it better than I can, but basically it’s people all over the world who share What’s on (Your) Workdesk on a Wednesday! Great fun to see what other people are working on and always hugely inspirational across all manner of craftiness. Join in if you blog or just pop round to visit others if you don’t – you might find someone who inspires you….